Mars, the fourth planet away from the Sun, is passing closer to the Earth than it has done in the last 65,000 years. The red planet, probably the best known due to its incarnations as a God of War, a Chocolate Bar and because it sounds a bit like SARS is quite a barren planet with little resources worth exploiting. A little bit miffed that the space race did not continue past the USA successfully putting a man on the moon to see which nation could put a man on Mars, the planet has taken steps to make itself more attractive to the current Bush administration. Stopping by at one of the stores of the supermarket chain Tesco, the Red Planet immediately pulled up at one of the petrol stations and proceeded to pump itself full of the various different fuels the station was selling. 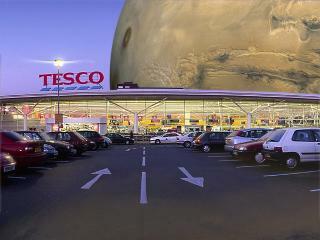 Typically, the car park at Tesco was full so Mars was forced to park at a les convenient one just down the road. The planet then headed inside, towards the breakfast cereals where it spotted a promotion giving away Tellytubbies fridge magnets. Laughing evilly, the planet proceeded to put all the packets containing the magnet of Po, commonly believed to be the President’s favourite Tellytubby, into its trolley. “If the oil isn’t enough, he’ll have to come here now to complete his collection of fridge magnets.” Mars boasted, unaware that President Bush had successfully purchased the entire set on eBay only last week. Mars’s duration close to the Earth was longer than expected as the pound coin dispenser on the trolley jammed and the planet was forced to wait for a security guard to release it. However, whilst it was waiting Mars insisted on telling passers by that it knew where Osama Bin Laden and Saddam were hiding and asked if they could pass the message on to Bush.